PLEASE READ THOROUGHLY BEFORE TESTING/POSTING YOUR IC7 RESULTS!!! RESULTS THREAD IS NOW LIVE!!! PLEASE ONLY POST WITH RESULTS WHEN YOU HAVE FULL RESULTS, OTHERWISE YOUR POST MAY NOT BE SEEN BY ALL IF YOU RESERVE THE POST FOR LATER RESULTS WITH IC7. PEOPLE TEND TO GO TO THE NEWEST POST, SO IF YOU WANT IT TO BE SEEN BY ALL, POST YOUR RESULTS ONCE YOU HAVE THEM ALL. ALL OTHER DISCUSSION/SUPPORT POSTS, GO RIGHT AHEAD!! PLEASE BE SURE TO BENCHMARK YOUR CPU TEMPS WITH YOUR CURRENT TIM AND RECORD YOUR RESULTS BEFORE USING IC7 FOR TESTING. WE NEED BEFORE AND AFTER PLEASE! Proper application is the key to this product. The nature and consistency of this product is likely quite different from what most of you are used to in a Thermal Compound. Don't use traditional methods of applying the TIM like razor blades, lines, x's, etc. Through extensive testing, the best application method has been determined to be a pea sized amount directly in the center of the CPU. The TIM should be adequately spread via the downforce of the CPU cooler (a sufficient amount of downforce will provide best results; minimum 50psi of downforce should be the goal for optimum results. please see the Innovation Cooling website for more info). Also, for coolers/surfaces that have many peaks and valleys, it may be beneficial to wet the surface(s) with a small amount of IC7 to initially fill the voids in the mounting surfaces...then proceed with recommended application as usual. Please click on the link below for application methodology and shoot me a PM if you have any questions. Keep in mind, IC7 has been formulated with the specific goals of providing superb thermal conductivity with short set times, but also for long term stability and performance without pump/bakeout through extended thermal cycling or usage. This stuff is very stable over long periods of time. Please do feel free to navigate through the whole Innovation Cooling website as there is tonnes of information on there that might prove beneficial. OPTIONAL INFO: PROCESSOR, VOLTS/CLOCKS, HEATSINK/COOLING USED, ETC. If you have any problems or need support, please feel free to post here for now. The goal is to get all this info posted in the results thread which I will create shortly and ask Gav to sticky also. Remember, proper application and good even heatsink pressure (goal should be minimum of 50psi or more) are crucial for peak performance. Too much or too little compound will impact your results so please do visit the Innovation Cooling website for Application Instructions with images and explanations. There is a direct link in the second post in this thread. For those with direct touch heatpipe coolers, you might want to try wetting the contact surface of the cooler with a tiny amount of IC7 to fill any small voids before proceeding with the normal application method. Last edited by Nademon; March 19, 2009 at 05:04 PM. Last edited by Jonwall; March 20, 2009 at 10:32 AM. Last edited by slntdth93; March 19, 2009 at 03:50 PM. So, results here are basically no change with idle temps, and load temps gave me 2C cooler results. I also have a feeling that my bedroom has warmed up a tad bit since I tested the MX-2, so there may have been more of a difference that way. System - Rig #1, Stock Clocks. Test Method - OCCT CPU Test, Default settings. Last edited by CasheKicker; March 27, 2009 at 06:05 PM. 2 degrees lower under load, sometimes goes down to 43 or up to 45 but not for long. Probably going to have idle temps tomorrow after idling the pc all night. I also used it on a Vendetta2 with a E3110 but i seemed to have gotten a larger change in temps. Did you try wetting the underside of the Vendetta2 first to fill in the small gaps in between the heatsinks? I did it that way and I can't remember the exact figures, but I know I got more than an 8C difference under load. 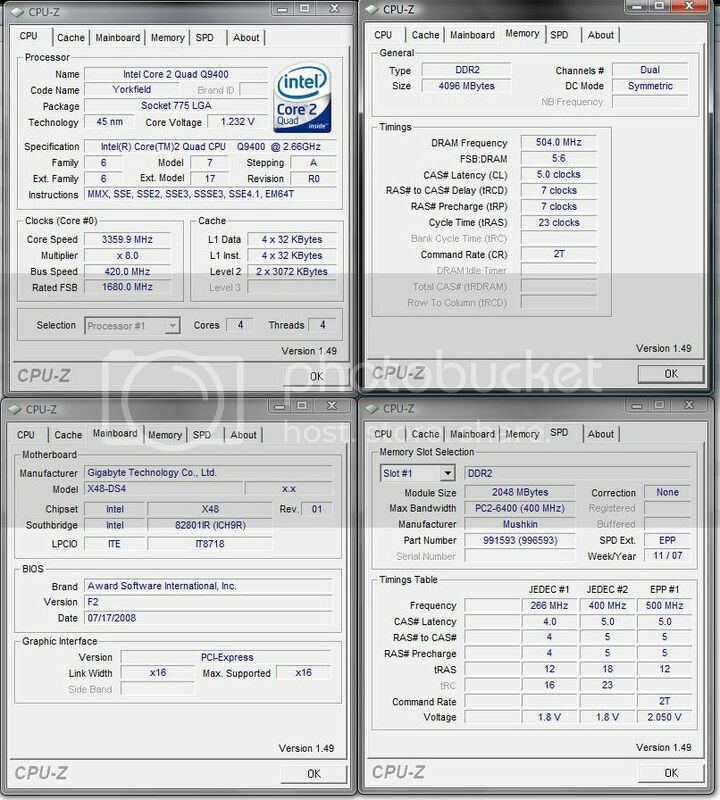 The E3110 is was OC'd to 4Ghz with a bit over 1.4v. And slntdth93, those are some great results!! that seems in line with what I got with a Vendetta2. Also, besides regular support/discussion posts, I think it would be best if everyone make a results post when they actually have results. Usually people just go to the newest posts so if you're reserving a post for later results, they may not get seen by everyone once the thread has tonnes more pages. Last edited by Nademon; March 19, 2009 at 04:29 PM. Ill do some digging around in my old posts on some forums to see if i can get the temps i had under max oc with the old stuff and compare it, it wont be a direct comparison because conditions would have been different but it should give people a vague idea of how well this stuff performs under higher loads. I haven't gotten all of the results yet but I'll post what I have so far with my current TIM. I should have some IC7 results later tonight at which point I'll update this post. To stress the CPU I used Prime95's small FFT test. To stress the GPU, I ran FurMark. Tests were run in an Antec P182 case with side panel off. Last edited by ASharp; March 19, 2009 at 11:11 PM.